10:30 a.m. Opening Ceremonies at Wisconsin State Fair Park. 11:00 a.m. Lunch (GFCF) will be provided by Gooseberries Fresh Food Market following the walk. 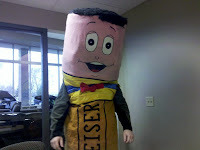 **To find our team, please look for “Stubby Heiser,” our pencil friend. He will also be joining us in the walk.